Content producer with high level experience creating broadcast quality video and written deliverables designed to build brands, educate and inform internal and external stakeholders and support sales and marketing. Success in a highly competitive marketplace with $50-$90k in annual outside sales from 2007 – 2013. Creative thinker with substantial large team experience as a writer, content developer and creative. Ability to effectively work across departmental divisions to integrate relevant information and strategic messaging into targeted content. Has taken hundreds of projects and assignments from nothing, to something – never having missed a deadline. Builds compelling multi-media content for blogs, broadcast, Facebook, Twitter, Youtube, press releases, newspaper opinion and editorial, websites, catalogs, brochures, reports, newsletters, promotions and Intranet sites. Deadline driven video producer executing planning, writing, shooting, editing, coding and presentation functions for broadcast quality video content. Extensive media experience. Gathering, writing and delivering award winning TV news and special programming content as a reporter and anchor in six markets across the United States. 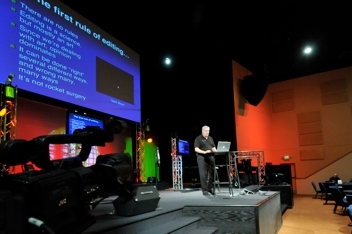 Production and event coordination. Media relations. Media training and coaching. Media analyst for CBS radio. Former columnist for Puyallup Herald and former Media Monkey blogger for Seattle PI. KBTC – Emmy award winning producer, reporter, videographer, editor and host of Northwest Now­ – a weekly public affairs television show. Responsible for all elements of editorial content and presentation including all field reporting, videography, booking, writing, hosting and final show assembly. On the team responsible for maintenance of the program’s website and social media engagement strategy. Involved in creating collateral for outside productions, participating in grant writing, public appearances, technical management and equipment acquisition, workflow development, and advising on curriculum. KBTC – As a contractor, relaunched the Northwest Now program. Reformatted the program, updated the entire production and added elements to bring the program up to broadcast standards. Won an Emmy for public affairs. Nominated for several more Emmys including two Full Focus documentaries. Griot’s Garage – Completed more than 80 video projects for company e-commerce and social media sites resulting in 100,000+ views with the goal of bringing otherwise static products to life and engaging customers. Apple Physical Therapy – Completed more than 20 video projects for the company’s website and Youtube channel in eight months including a video that helped bring about the best recruiting year in company history. Brought the, “When it Hurts, We’re Here” tagline to the company. Specialized in marketing services by creating stories told through the testimonials and experiences of real patients. Advanced Broadcast Solutions – Produced an award-winning monthly magazine style webcast to support the company’s sales and marketing efforts and to build relationships with suppliers and clients. Writing for brochures and client communications. Video for supplier (Genelec) received 20,000 Youtube views. Brought the, “Telling Stories with Technology” tag line to the brand. Windermere Puyallup/CR -Managed and executed all major internal and external communications programs for the largest office in the system with 150+ agents and staff including creating all video-based and written content for the web, Comcast TV and live streaming. Writing for press releases, blogs, internal policy watches, training and change management. The award-winning Homes Northwest received 4,000 views per month and was the top rated externally produced program on Comcast’s Spotlight platform during its 19 month run. 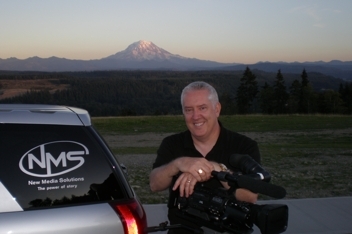 Comcast ­– Produced TV/webcast programs including Tacoma Rainier’s Insider, Never Too Late, and the award winning Made in Washington for distribution on the Spotlight on-demand platform. Cascade Christian Schools – Produced award-winning video series that resulted in more than 10,000 views tied into the school’s recruiting campaign. Other clients – Bethel School District, Communities in Schools of Tacoma, BLRB Architecture. Gathered, wrote and presented award-winning TV news and special projects content for News 12 Networks – the 24-hour regional cable news outlet in the New York/New Jersey area specializing in personal financial writing through the award winning It’s Your Money franchise. Extensive wall to wall live breaking news coverage as a lead anchor. Award winning special projects producer. Extensive public speaking and community outreach. Writing coach and mentor. Produced and hosted Town Meetings and developed content for political programs and helped plan political coverage. Poynter Institute attendee. Past President of the New Jersey Associated Press Broadcaster’s Association. Gathered, wrote and presented TV news content as the weekend anchor and a field reporter at WSYX-TV in Columbus, Ohio. Extensive Statehouse and political coverage along with breaking news, local government, crime and general assignment reporting. Enterprised TV news content as a field reporter for the ABC affiliate in Sacramento, California and stations in Louisville, KY, Terre Haute, IN and Yakima, WA. Beats included the environment, crime and courts, the legislature, policy, and water resources. Extensive development of video production, writing, enterprise and research skills. Provided coverage in a wide variety of high pressure, live, breaking news stories.